I never really understood the full appeal of Chipotle, but that changed once they added sofritas as a vegan protein option to their menu. Yet still, I am my Mother’s child and although I would complain about this very thing in my adolescence as an adult I find myself repeating her mantra, “I can make this at home”. And so, although I don’t mind going out to eat every now and again, I love the dollars (and calories) saved by creating/recreating recipes from home. Also, ain’t nobody got time for Chipotle’s loooooooooong lines, that big ‘ol bowl is truly delicious but for me just not worth the wait, which is why it’s so clutch that I’m able to whip up a homemade version right in the comfort of my own kitchen. This sofritas recipe takes less than an hour to make with just few ingredients. Trust me it’s a super-easy — but very worth it — and an awesome way to make a delicious meat-free meal. Start with extra-firm tofu and squeeze it to extract as much liquid as possible. I just wrap the block in paper towels and place in a dish, then set a heavy dish on top to press it. To roast the poblanos, place them into the oven at 400 degrees F once it shrivels up and darkens, take it out and wrap it in foil paper for about 10 mins. Then you’ll remove the seeds and chop it up. *Side Note: I love flavor and I don’t mind the heat so I add lots of spices to my recipes. So, this recipe is the minimum amount of spices, feel free to add more to season to your liking. I don’t use much salt but I don’t mind adding all purpose seasoning from GOYA. 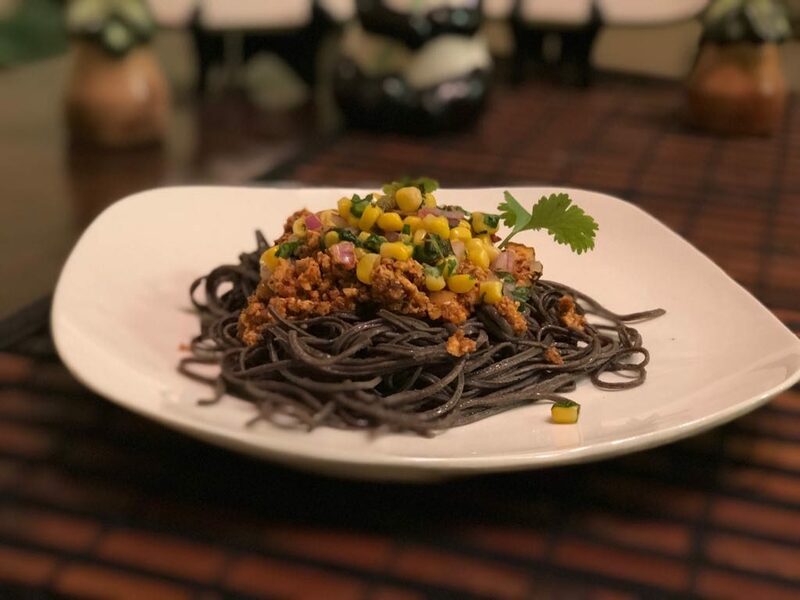 In the photo, I paired the sofritas with black bean noodles for a protein boost and topped it with roasted corn salsa.